Pitt senior linebacker Oluwaseun Idowu first came to Oakland from North Allegheny High School in 2014. 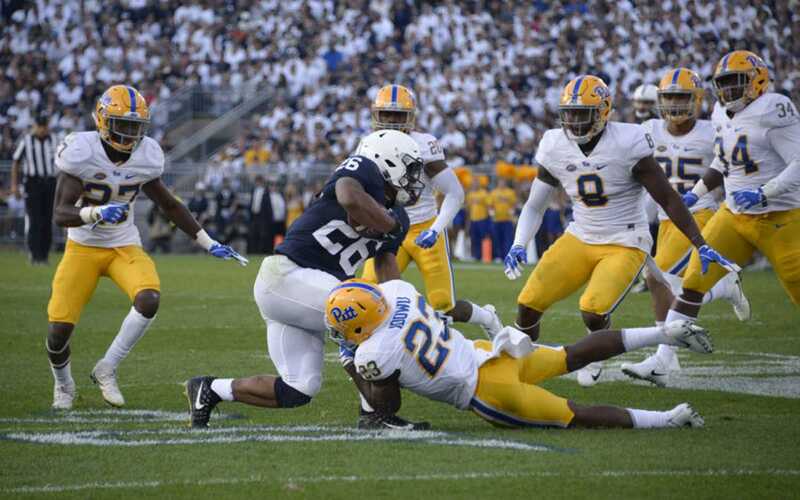 There, Idowu played running back but transitioned to linebacker shortly after walking onto the Pitt football team in the fall of 2014. After redshirting his first year, it wasn’t until his second season of eligibility that Idowu found consistent playing time in 2016, when he was third on the team in tackles with 74 total. Idowu led the team in total tackles with 94, tackles for loss with 11.5 and sacks with five this past season. The Pitt News caught up with Idowu following the Panthers’ second practice of the spring. The Pitt News: As a team, you guys kind of took a step back from the 2016 season. What’s your biggest takeaway from a team perspective? Oluwaseun Idowu: I would say it’s just growth as a team in general. We had a lot of young guys last year, a lot of guys growing up throughout the season. This year we have everybody returning, so everybody’s kind of hungry from how last season went. We’ve got young guys growing up, guys returning. We have a bunch of older guys — a bunch of seniors this year. So from that, we take whatever we learned last year and throughout the last couple years and improve on it. I think we have a lot of knowledge coming in this year compared to last year. TPN: What do you try and pass on to the younger guys? OI: The biggest thing we always talk about is the mentality. It’s a tough, dog-eat-dog mentality. No matter what it is, we’ve always gotta go at it to the very end. We just gotta keep that going and improve on that as much as we can. TPN: Statistically, you had your best season last year, leading the team in tackles and sacks. Do you have any personal goals that you set every season? OI: You always try to reach for more, but at the end of the day you have to focus on the team goal, which is an ACC Championship [and] a National Championship if possible. That’s my main goal and something to focus on for me. I think everything outside of that will take care of itself … No matter what I do, I try to play at an ACC Championship level. TPN: You were a running back in high school, among other things, and you walked on at training camp and ultimately became a linebacker. You were one of the best defensive players on the team last year. What’s that feeling like coming this far, where everything’s kind of changed? OI: It’s a really great feeling. Every once in a while I’ll talk to my teammates, we’ll be hanging out, I’ll just be like, “Man, think about where we were three years ago, four years ago.” We’ve come a long way, I’ve come a long way. Everybody knows the story. It’s a good feeling to have that recognized and also have that to look back on. Like, “Wow, you’ve been through so much, you made it through all this adversity and now you’re here, where you set your eyes on to get to. You’re on your way to make it to the the next level and all these other things are about to happen for you in life.” But you gotta keep a certain amount of humility and never forget where you came from. TPN: Are there any specific weaknesses from last year you’re trying to work on, or something you could just be better at this year? OI: Just to eliminate certain times where I was absentminded and be locked in 100 percent. There is no perfect, but just trying to always reach for some kind of perfection. I want to try to take it to the next level each time I step on the field and focus on little details like knowing what the line is doing — not just my job, but other guys’ jobs around me and how that fits in with what the offense is doing now is really where I’m at with that. I try to see what offenses are trying to do with us, where they’re trying to attack us, how I can help with that, how I can see things ahead of time — jumping on stuff like that. Taking my knowledge to the next level is really the main thing. TPN: What’s your off-season routine like? OI: Pretty much watching a ton of film, being in the weight room and taking care of my body. It’s a long season, it’s a long time, a long process to get to the season. That’s an everyday routine — getting in the film room, helping out the young guys, of course. And that helps me out as well — to teach them and learn new things I might not have seen at times as I teach them. TPN: Is there anyone in the NFL or who’s played in the NFL that you look up to or model your game after? OI: Ever since I was in high school, I’ve looked after Patrick Peterson. He’s a real cool, collected guy. Larry Fitzgerald is always someone coaches talk about here — he’s a Pitt man, he’s a good man. Landon Collins, younger guy, I’m a big fan of his. All those guys I try to model my game after and how I carry myself on the field. TPN: Obviously you’re focused on this season, but is the NFL draft something you think about in the back of your mind, knowing it’s your last year? OI: Even going back to freshman year, we come in with the mindset of, “Hey, we’re trying to get to the league.” Everybody’s trying to get to the league — that’s a goal. It’s the last year, it’s coming close to that time to make those things happen, so I’m really excited for what’s coming up next. Gotta put some work in. No doubt we’re gonna get there.